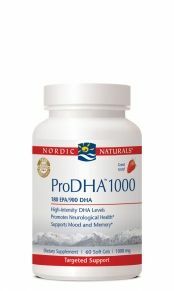 The most powerful non-prescription omega-3 concentrate available in triglyceride form. 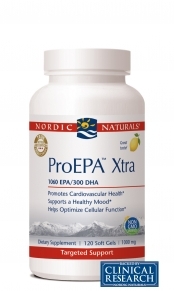 EPA Xtra is an omega-rich formula that offers increased potency in fewer soft gels. 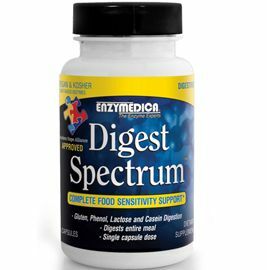 Research shows that EPA benefits cardiovascular health, joint mobility, proper immune function, and colon health, and supports the body’s natural anti-inflammatory response. 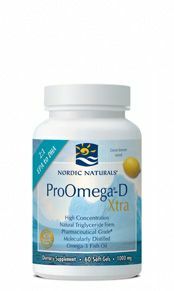 Other Ingredients:purified deep sea fish oil (from anchovies, sardines), soft gel capsule (gelatin, glycerin, water, natural lemon oil), natural lemon oil, d-alpha tocopherol, rosemary extract (a natural preservative). May have been manufactured in the presence of products containing soy derivatives. Definitely the best value for money that I could find and a company that has an excellent reputation for quality. I noticed a difference after 3 weeks. Nothing startling, but it seems to be slowly improving things. Don't do as I do and employ the "well if 2 is good, then 4 would be better!" method. It gave me heartburn when I increased the dosage. I'm now sticking with the recommended dose and I've had no further problems. A: Yes, after th 14 day trial, if you do not want to continue with the membership, you can cancel. If you do not cancel by the 14th day, then a charge of $50 will be applied and you will receive full membership benefits for a whole year. If you spend at least $15-$25 a month, this membership could be beneficial to you with the additional 25% off you will receive from our Seacoast line and the additional 15% you will receive from all of our other brands. Question: Does Pro EFA Xtra help to remove fluid around the lungs and extremities? A: Research shows that EPA promotes cardiovascular health, joint mobility, proper immune function, gastrointestinal health, and healthy inflammatory levels. Please consult your physician to see if this product can help remove fluid from the lungs.